Mindful Echo loves her dog more than her garden. I'm not big into gardening. While I do love to admire the work that others have put into cultivating beautiful beds of flowers, and I will never turn down a home-grown vegetable, when it comes to the actual labour of it all, it's not really my jam. Personally, I prefer to spend my outdoor time oot and aboot with my pup, Rigby. While we're out, I'm careful to stop him from peeing on the lawns of neighbours and I try my best to direct him to the tree trunks that line the streets instead. Still, people seem to be quite sensitive to the dogs that come upon their precious gardens (And I don't mean to sound facetious, I know they are quite precious to serious gardeners). So, I'm wondering, is it really that big of a deal? When I did some Googling to find out, I was met with so many posts of people complaining about their dead plants, as well as a bunch of tips and tricks for keeping dogs away. It took me a bit of deeper digging, however, to actually get to the science behind the problem with puppy pee. Apparently it's a deadly mix of ammonium, salts, and other chemicals contained in the pee that makes it toxic to plants. This article suggests training your dog to pee only on the curb and this article suggests carrying around water to dilute the puddle post-pee. Frankly, I'm not going to do either of those things...and I don't think that makes me a bad person. I'd say, at best, I'll continue to steer Rigby away from privately-owned gardens but beyond that, I can't say. Any other dog owners care to weigh in? Great American Backyard, Er, Camera Out? This weekend is National Wildlife Foundation's Great American Backyard Campout, which has the goal of connecting kids (and adults) with nature. I wholly support the goal but, after back surgery last year, camping is not on the menu. I've found an every-day way, though, to get the kids - and myself - outside and truly connect with nature. Years ago, my kids saved up for a cheap-o digital camera for a National Park trip. For the last year or so, those cameras have gathered dust. Until genius - or desperation - struck! On one long and activity-less weekend day, I handed my complaining 11 year old his camera and instructed him to go outside and take pictures of bugs. Why bugs? Because they are easy to photograph. Pollinators especially. You can usually get a good shot of them while they are busy gathering pollen. Throw in a few rollie pollies and maybe some flowers - which are even easier because they don't move! 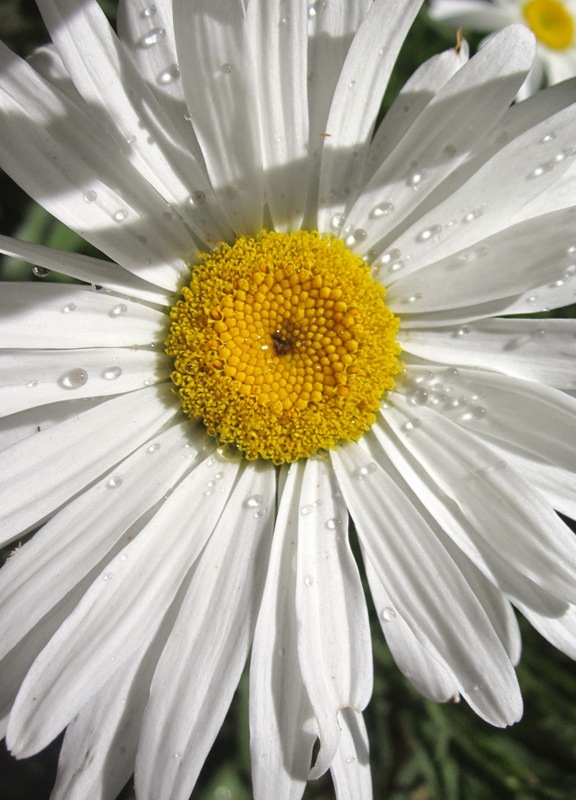 My 11 year old's photograph of a Shasta daisy. My son became enamored with nature photography and even started a blog. He printed out his photographs and gave them as Fathers' Day gifts. 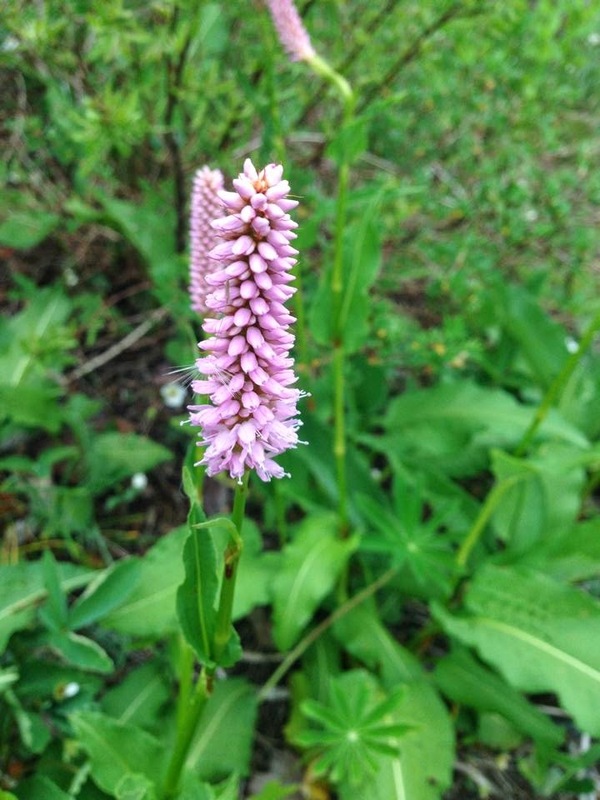 I started Spot The Pollinator - a weekly link up of bug photographs. We rejoiced in a few hours of summer boredom sucked up by photographing nature. But that's not the end of the story. We regularly take our cameras into the back - and front - yard now. We snap pics of insects, birds, squirrels and our resident chickens. Backyard Birding: A Western tanager feeds its juvenile in our garden. A camera in tow gives hikes or even a walk down the street a new dimension. Spot the rabbit, the deer, the butterfly, the lizard! A lizard suns itself on a local hike. We pack up the cameras when we visit the grandparents, the aunts and uncles, go on vacation. My 11 year old's photo of a honeybee in his grandparents' garden. So, while it may not be a camp out, get your camera out this summer and explore the great outdoors - or at least your own backyard. This post is part of the Homestead Barn Hop, Backyard Farming Connection, Maple Hill Hop and Tuesday Garden Party. Queen Composter feels the need to explain that being green doesn't mean one is anti-chemistry. Whenever a movement becomes popular there will be people who espouse that way of life without full understanding, and there will be the push back and criticism from others. Such is the case with living a green life and trying to avoid toxic ingredients. Can We Trust Commercial Products? One way people try to be more eco-minded is with household cleaners and personal care products. Without a chemistry degree and knowledge of how chemical compounds react and affect the human body, I find it difficult to know the difference between greenwashing products that throw around buzz words like "natural" and "eco", and truly non-toxic products. I am a diligent product ingredient reader, but I may not know what sodium chloride, laurel glucoside, sodium laureth sulfate, ethylene oxide and 1,4-dioxane are. They may or may not have toxic effects on humans, but I cannot trust that they are safe, or assume that they are dangerous, if they are listed in product ingredients. In case you are wondering, sodium chloride (salt) and laurel glucoside (a surfactant from coconut oil and sugar) are fine, but ethylene oxide, sodium laureth sulfate and 1,4-dioxane, which can be found in soaps, are not fine. But I did not know this without doing some reading because I only studied chemistry until grade ten. How many people do this before they go shopping and grab dish soap or shampoo off the shelves? I am, therefore, electing to learn how to make my own products rather than reading about each and every ingredient in the commercial ingredients I purchase. 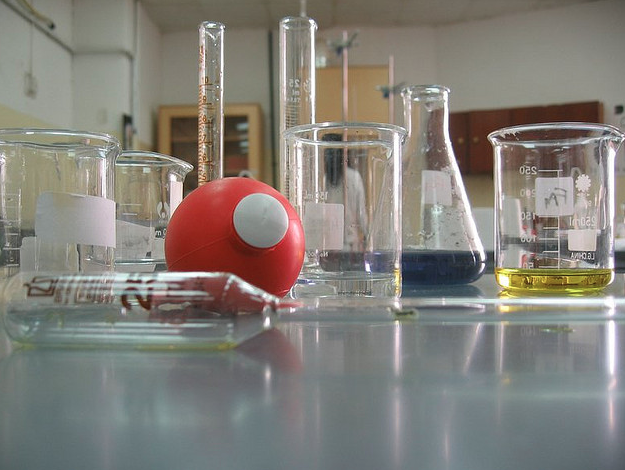 Is the Eco Movement Uninformed About Basic Chemistry? The pushback is coming in the form of "science defenders" who feel the need to point out chemicals are not bad, and that everything is made of chemicals. If we make our own cleaning products from vinegar, salt, or baking soda we are idiots because these too are just chemicals. Chemicals and chemical compounds are natural because they are a part of everything and naturally occurring. How silly of people to make natural cleaners that are really just chemical compounds. I think the issue is when green-minded people speak of wanting to avoid nasty, carcinogenic or hormone disrupting compounds but speak of avoiding nebulous "chemicals". We are not trying to avoid using chemicals. We do not trust the corporate world to have our best interests in mind when they make their products. They use stabilizers to maintain the consistency of their product over time so it does not separate or degrade. They use fragrances to make their product more appealing to consumers. However, it is often these very ingredients that are toxic. For example, sodium laureth sulfate makes products foam (surfactant), which is a quality that we like in our shampoos, toothpastes and soaps. However, sodium laureth sulfate is also a known human carcinogen. Let me repeat that, a known human carcinogen in toothpaste that we may ingest! Even sodium lauryl sulfate, which is not contaminated with impurities during the manufacturing process as is sodium laureth sulfate, but may be an irritant, is found in natural commercial toothpastes. 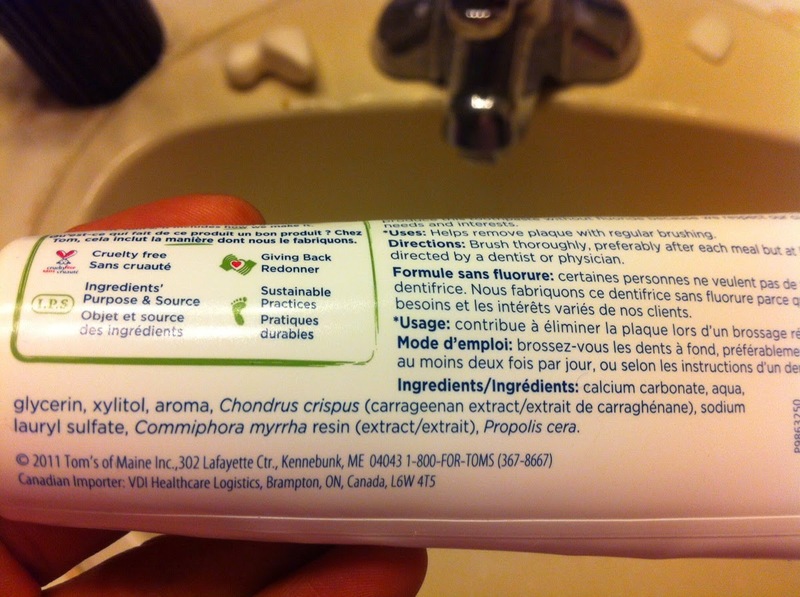 Sodium lauryl sulfate in "natural" toothpaste. But chemicals are not bad. That is like a classic syllogism of deductive reasoning: sodium laureth sulfate is a chemical compound and a carcinogen, therefore chemicals are carcinogens. 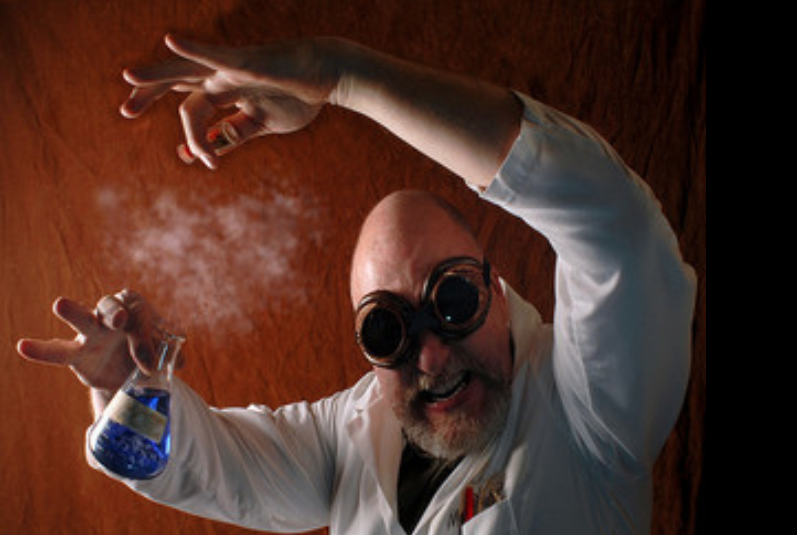 I hope that people are more intelligent than falling into the trap of chemicals equal bad. I would like people to understand that when I research DIY recipes for hair cleaner, facial cleanser, toothpaste, jewelry cleaner, dishwashing detergent, all purpose cleaner and laundry detergent I am not trying to avoid "chemicals". I am trying to avoid harmful ingredients, such as fragrances, that can cause a myriad of health concerns. That is why I am gradually eliminating commercially produced household products from my home. Not because they are "chemicals". Do you make your own cleaners and personal care products? Who doesn't love sunflowers? 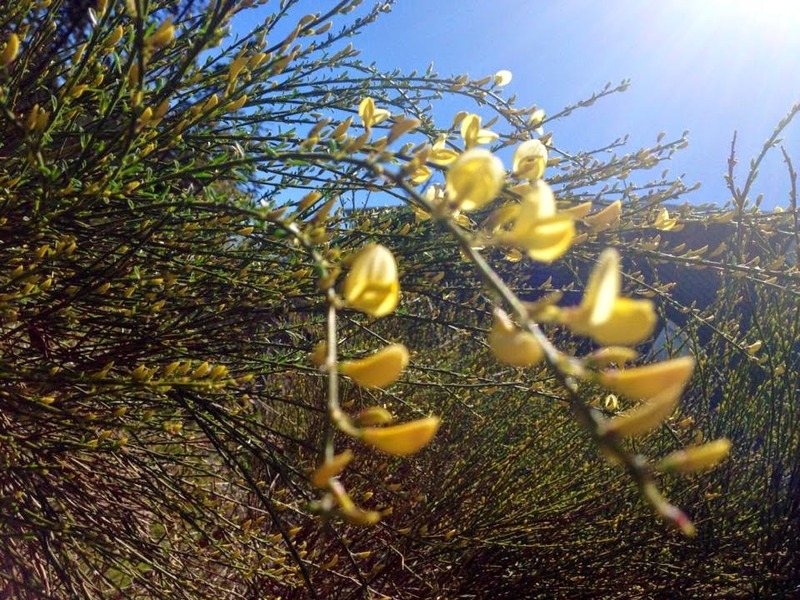 They emit happiness, their bright yellow faces turning with the sun. Their sturdy stocks lifting them above the hubbub of the garden. As much as sunflowers cheer us, though, they do much much more! Even when they are a tad more than a seedling, the dark green leaves of sunflowers stretch out, enticing small birds - finches, tanagers - to feast. Once their dinner plate sized blossom unfurls, pollinators partake. The days pass and the sunflower's face becomes bigger and bigger, the petals shrinking ... until nibbles appear, signaling that the seeds must be drying. Squirrels and bigger birds delight, chewing away the sun. 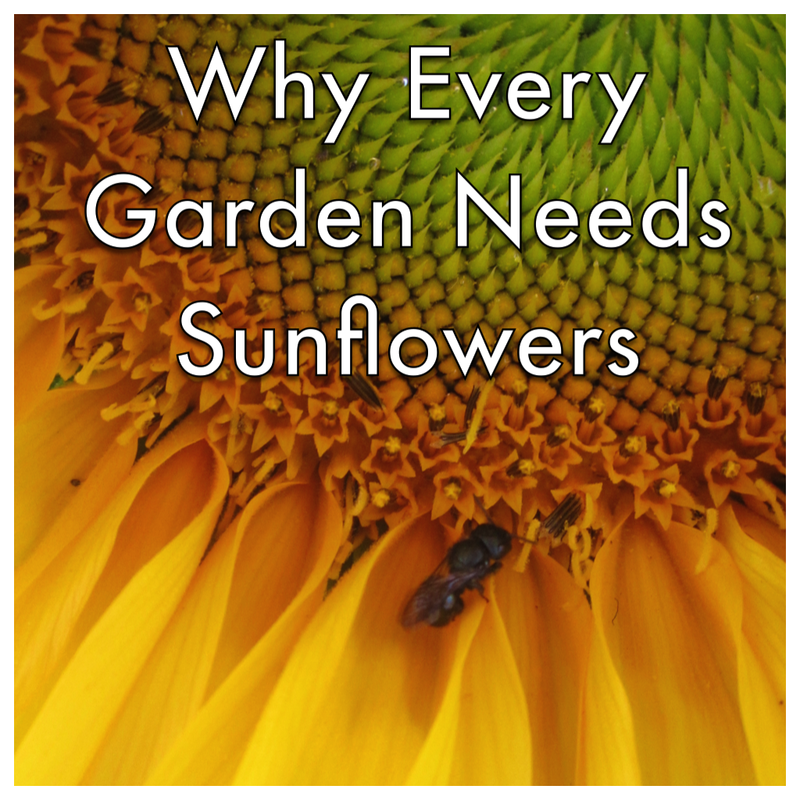 Seed to seed, sunflowers are THE ultimate wildlife plant. Sure, we humans can be a bit picky about gnawed faces and shredded leaves. Once I stepped back from the idea of an ideal sunflower, though, I saw the sunflower for what it was. 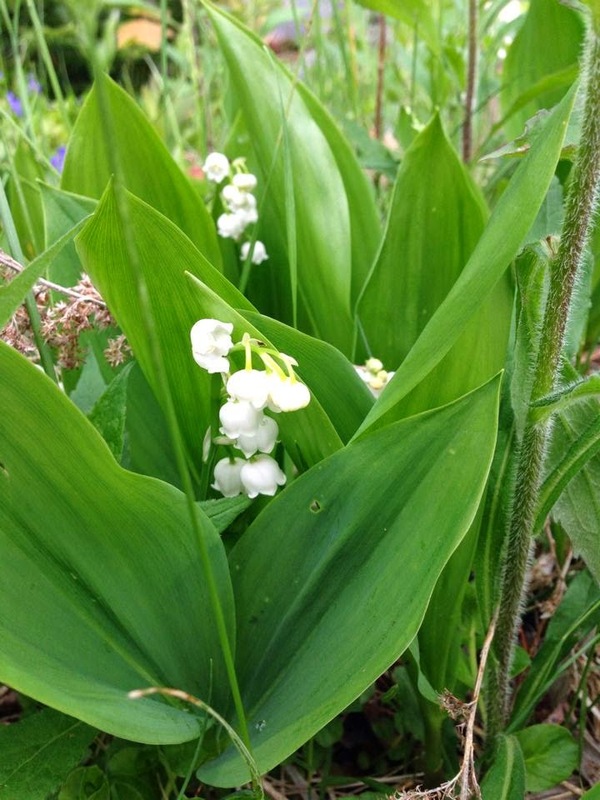 A miraculous life, spreading beauty, soaking up toxins, and providing food for species big and small. Plant one - or ten - in your garden! 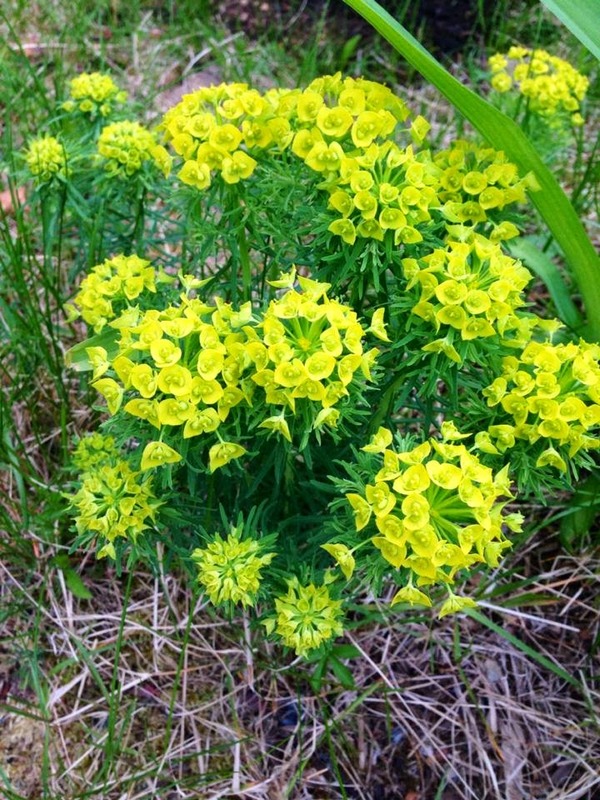 This post is part of the Tuesday Garden Party at Oregon Cottage, Maple Hill Hop, Green Thumb Thursday and Homestead Barn Hop. While local teachers are about to go on strike, the Climate Crusader is reflecting on how many environmental lessons are learned at school. Where I live in British Columbia the public school teachers are starting a full-scale strike tomorrow, following a few months of job action. School would normally run until the end of next week here, but it looks like summer vacation may be coming early. 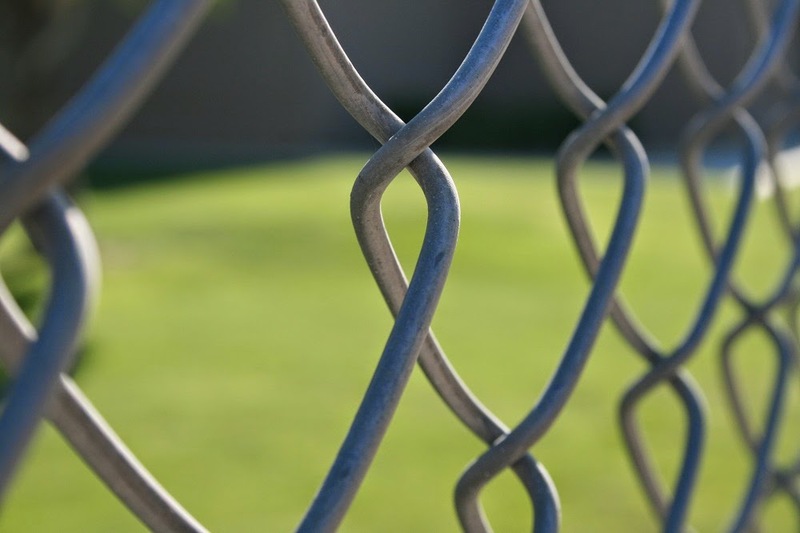 Many people, myself included, were feeling optimistic over the weekend as the union and the public school employers were in negotiations, but as of this moment it looks like the two sides are still some way from reaching a resolution. I don't want to get overly political, and in truth I'm not sure that I'm aware enough of the situation to form an educated opinion. However, as a product of the local public school system, and as the parent of two current public school students, the strike has me thinking about teachers and schools and the environment. We learn a lot of lessons in school. Some of them are on the curriculum and some of them aren't. Some of them are forgotten as soon as we walk out of the classroom, and others stick with us for life. Some of them are positive and some of them aren't so much. Reflecting on my own experiences in school, I can see how my teachers helped to shape the way I view the world, including my place in the environment. Some of the ideas I encountered for the first time at school include recycling, global warming, the impact of deforestation in other parts of the world and the importance of water conservation. My teachers introduced me to concepts that continue to shape my actions today. 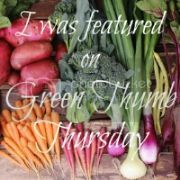 I consider myself to be a pretty 'green' person, and I talk to my kids about the choices I make and why I make them. Even still, they come home from school and share ideas they've heard in class that I haven't shared at home. They've shared information about plant life cycles, the plight of the frog, environmental conditions in distant countries and a whole lot more. They've also participated in projects like classroom composting and gardening, programs to encourage students to walk or cycle to school, and creating art from recycled materials. School supplements their environmental education in a number of ways. Of course, no school is perfect, and not every school program is a winner. All the same, I believe most school communities are striving to create educated, informed citizens who are aware of how their actions impact the world. If it takes a village to raise a child, schools are undeniably part of that village for most parents. The teachers spend a lot of time with our kids, and in the process our kids learn and grow and change. I am grateful for the work they do, and I am grateful to know that my kids are gaining insight into how the environment works and how they can make green choices at school. Here's hoping that the strike ends soon, that everyone is happy, and that my children and their teachers can enjoy a positive (and green) end to the school year. Since we began talking about buying a house I have had dreams of a beautiful vegetable garden. I want to grow food, not lawn. It would have all the yummiest veggies and pretty flowers that would attract pollinators... you know. It would be a-may-zing. We totally had time to plan our garden this year too. We took possession of the house in the middle of a ridiculously cold winter. Unfortunately, I didn't think it through that a) gardens cost money and b) we'd need to build a raised bed. And we don't have any tools or supplies to make one. Oh yeah- and I know absolutely nothing about gardening and plants. I can barely keep a cactus alive. A few weeks into stuff finally growing in our yard and it's even more clear that we really should wait a year before planting a food garden. Instead I started photo documenting my discovery of the plant and flower life that was emerging in our yard. 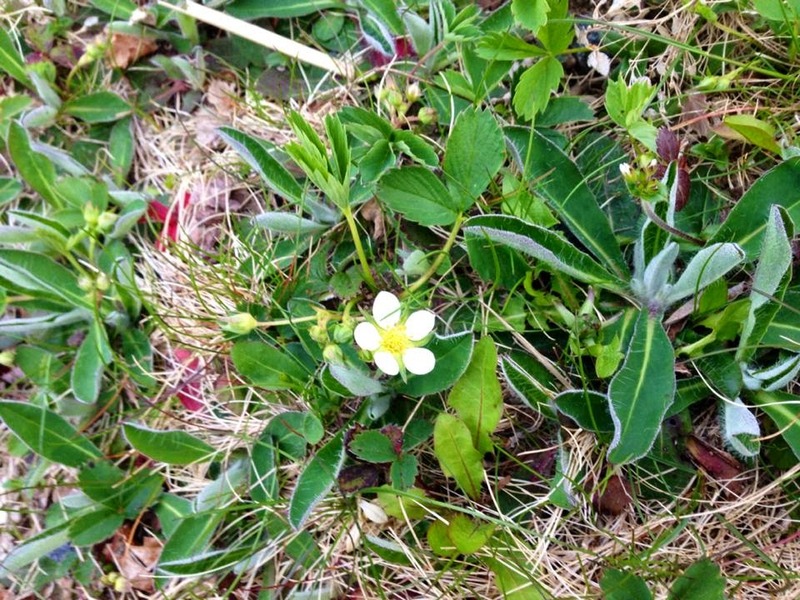 It quickly became evident from a few surprises that I can barely tell what is a weed and what isn't. Dandelions are about the only thing I can pull up with confidence. Although I have days where I really want a neat and tidy garden, with mulch covering all the ugly weeds (or ARE THEY??? 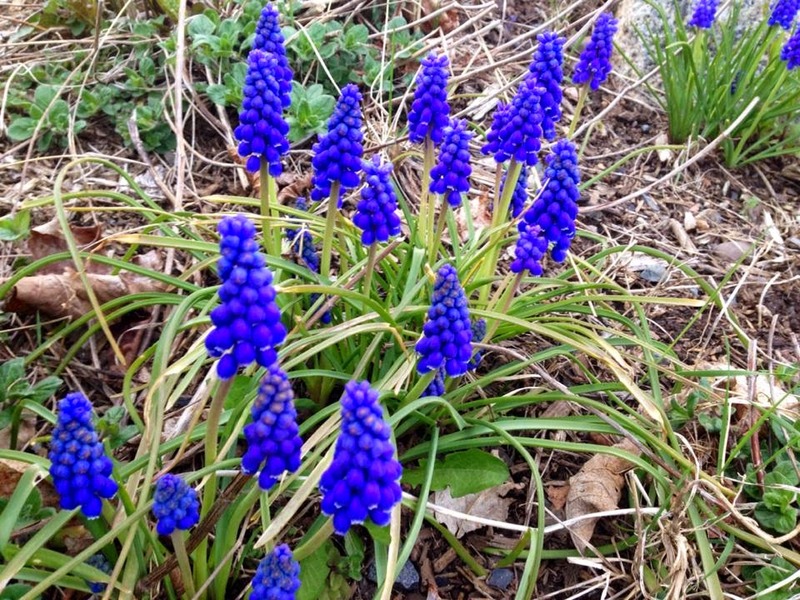 ), I am loving discovering the daily surprises our garden gives us. No fertilizer, no pesticides and let's see what grows! Mindful Echo is not on board with the creepy crawlies. I get it, nature. Bugs are important. They fertilize our gardens. They feed other creatures. Okay. Okay. While I was out walking yesterday I saw TWO armyworms (also known as tent caterpillars) dangling from trees. I know what you're thinking: two is not a very big number, right? Right. To me, though, those two little insects are a buzzing alarm clock that is shaking me awake after a long, winter, bug-less slumber. Immediately upon seeing them I was transported back about 15 years to one of my summers spent in Thunder Bay, Ontario. The armyworms there were TERRIBLE. They decimated neighbourhoods of trees and would rain from the branches and onto the sidewalks and unsuspecting passerbys. They would crawl from the grass and onto our shoes, or up our clothing. It was not unheard of to find them in your hair. While camping, they would drop onto the tent leaving it bespeckled with squirming shadows over our sleeping faces. I'll spare you some more horrifying details though. You're welcome. If you want to see what I'm talking about, click here. I found this Google Image search panic-inducing. Since being in Halifax, Nova Scotia, I haven't encountered more than a handful of the monsters, nor do the moths they turn into ever pose more than a mild nuisance here. I'll admit it though, I'm worried. I know that these particular bugs can be problematic for certain crops. I take solace in the fact that they are a nuisance to gardeners and farmers; it justifies my disdain. What do you think though? How important is it that environmentalists embrace every part of our ecosystem? In which the Parsimonious Princess uses alliteration to remind you to think twice before throwing something in the trash. My grandfather grew up during the Great Depression. As you can imagine, during that time he learned some pretty thrifty habits, ones that stayed with him for the rest of his life. One of those habits was reusing things before he threw them out. He definitely took the mantra "waste not, want not" to heart. My family and I always joke that my grandpa was green without even knowing it. He was ahead of his time! We kids would drink out of washed-out plastic yogurt cups instead of glasses when we needed water.When we wanted to draw, he would pull out a big tin of broken crayons (probably from when my mom and uncles were kids), which we would use to draw on the back of paper that had already been printed on. He had a bar of soap at the sink in the bathroom made exclusively out of saved-up soap slivers (you know, that little slip of soap that remains when you're almost finished with it) -- I just thought it was rainbow soap and he bought it that way. He had a specific drawer in his kitchen where he stored plastic grocery bags and bread bags and every doorknob in his house had rubber-bands around them. The guy didn't throw anything out unless it had been very thoroughly used. When I first started blogging as the Parsimonious Princess years ago, some of the very first posts were about reusing things that others would throw out. I call these "random reuses" (what can I say? I'm a sucker for alliteration.). Maybe it's in the genes, but I love finding a second life in things; it's a sort of challenge. Today, I thought I'd share a few of my favorite reuses, the ones that I either use the most, the ones that I have benefited most from, or the ones that simply would have made my Grandpa proud. Summer is here and that means it's time to camping again! This random reuse is one of my favorites because it works so well. All you need to make a hand-washing station for your camp is a gallon-size jug (I used an empty vinegar one), a couple golf tees, and a bungee cord or two. Poke a couple holes in the bottom half of the jug with some golf tees. 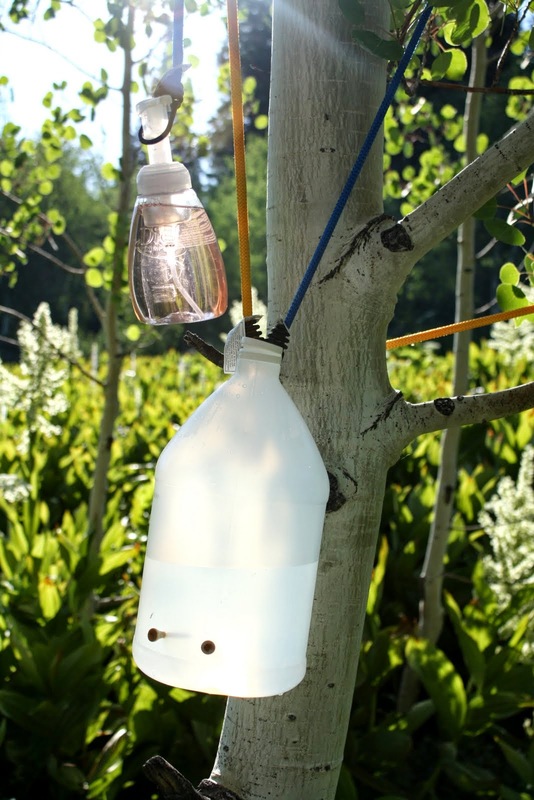 Once you've made the holes and left the golf tees in place, fill up the jug with water and hang the filled jug (and some soap) from a nearby tree with the bungee cords. When you need water for washing hands or brushing teeth, simply pull out one of the golf tees, and you'll have a stream of water to use. What's so great about this hand-washing station is that when you hang the jug in a sunny location, you get warm water! I tell you, it feels like a luxury to have warm water to wash up with! My husband owns a lot of t-shirts. We give the old ones to the thrift store but others aren't quite up for donation. These are the ones that have stains, holes in the armpits, or are super-faded. Instead of throwing them out, one way I like to repurpose them is to transform them into bags. It's really easy to do -- I simply turn the shirt inside out, cut the sleeves and part of the neckline off, and sew the bottom hems together (for complete step-by-step instructions, you can check out my post about it here). Or if you have a phobia of sewing machines like I used to, you can try this no-sew version. It's also an easy way to make a bag -- I actually taught 30+ teenage girls how to make the no-sew version at a church camp-out. 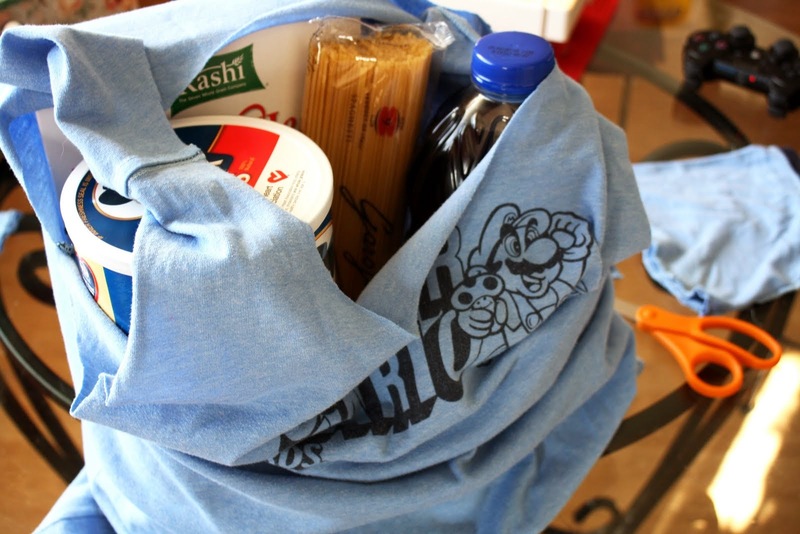 We've used these bags for trips to the grocery store, the library, the pool, the park, and even for trick-or-treating. Those green-and-yellow sponges so commonly used for dishwashing harbor all sorts of nasty bacteria. Dishcloths are a cleaner alternative, to be sure. The problem with them, I've found, is that dishcloths just don't work as well as those sponges. One way to fix that problem is use to use the plastic mesh bag from a bag of onions or oranges. Cut the tag off one end of the bag so it's like a tube. Fold the dishcloth a couple times and slip it into the mesh bag tube and then continue to fold until it's the size you want. Once you're done using it, pull the dishcloth out and throw it into the laundry. 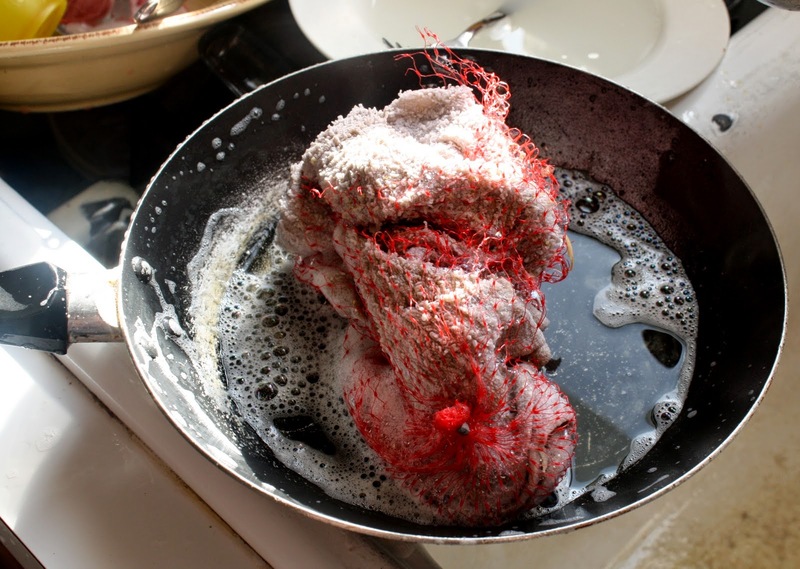 Rinse off the mesh bag and hang it up to dry. Whenever it gets too worn, toss it out and use another. I'll be honest, at first I was a little skeptical when I learned this suggestion, but once I tried it, I was really surprised by how well it worked. In fact, it worked just as well as the green side of those sponges I used to use! 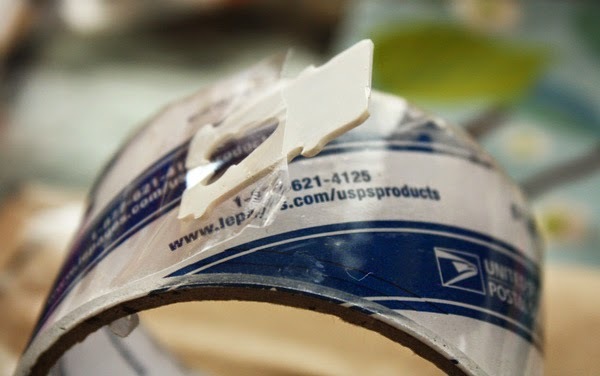 Old bread tab = less time fiddling around on the roll of tape trying to find the beginning. This is such a simple yet fun craft for kids. To make one, simply punch a couple holes at one end, spread peanut butter on the toilet paper tube, roll it in bird seed, thread the yarn through the holes, and tie onto a tree branch. The birds loved our feeder -- and my boys loved to watch. When my oldest was starting to paint when he was around three years old, I used paper plates as his paint palettes. I later realized that a washed plastic lid works just as well, if not better. I find that the 16 oz. 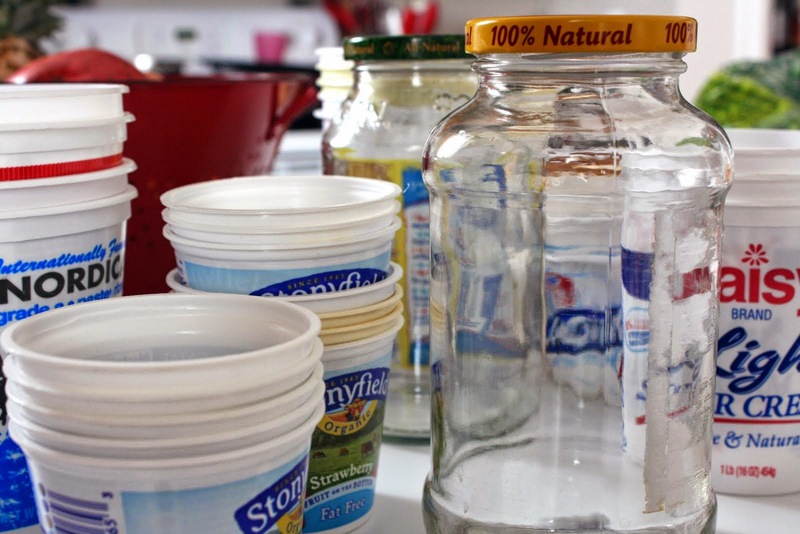 containers (like the ones used for sour cream or cottage cheese containers) work particularly well. When your child is finished, you can either throw the lid out or wash and reuse. Sometimes, I don't even wash it; I just add more paint on top of the dried paint from before. Much better than a paper plate. I had a reader send me this tip about turning cans into stilts. 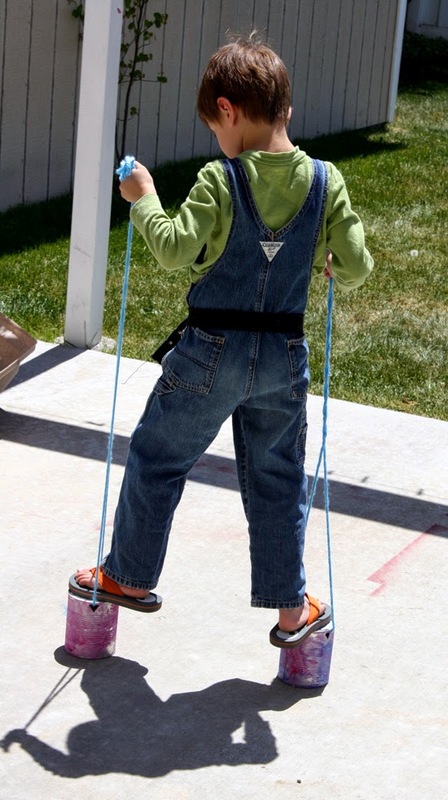 I used a couple 28-oz tomato cans for my son's stilts. I let him paint them and then I made a couple holes in each, threaded some yarn through them, and they were done. Such a simple project and they kept my son (and the neighborhood kids) entertained. Of course, no list of random reuses would be complete without mentioning how I start my seeds with empty milk jugs. This reuse truly has changed how I grow my garden. I cut the milk jugs almost in half, fill the bottom with potting soil, plant my seeds in each one of the jugs, and put them outside. 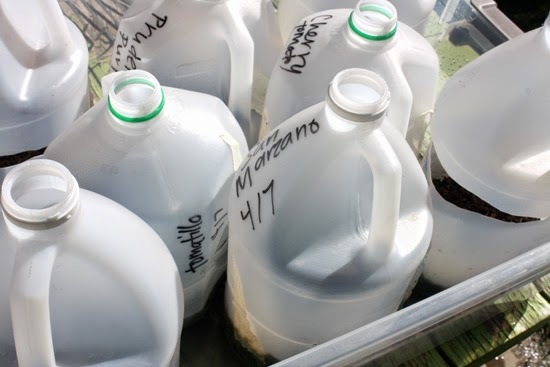 This method for seed starting can be used outside even when there's still snow on the ground. The milk jugs work like little greenhouses. This is my third season starting my tomatoes this way and it still makes me excited. It's just so easy and works so well, I feel obligated to tell people about it whenever I can. You can read all about it in my Green Phone Booth post here. These are only a handful of the random reuses at my house. I've turned a paper towel holder (since we don't use paper towels anymore) into a plastic bag drying rack. My oldest made a guitar out of an empty cereal box. Old, faded flannel receiving blankets were turned into cloth wipes for cloth diapering. Old cloth diapers and hole-y socks turn into rags for cleaning the bathroom. I've even reused dryer lint to make firestarters for camping, emergency preparedenss, and to fuel my beekeeping smoker. A second life can be found in so many things and this leads to less waste -- less waste in the trash and less waste of the money in our wallets. The combination makes this frugal girl -- the granddaughter of a "green grandpa" -- pretty happy. Queen Composter is sharing new ways to spend time playing outside. 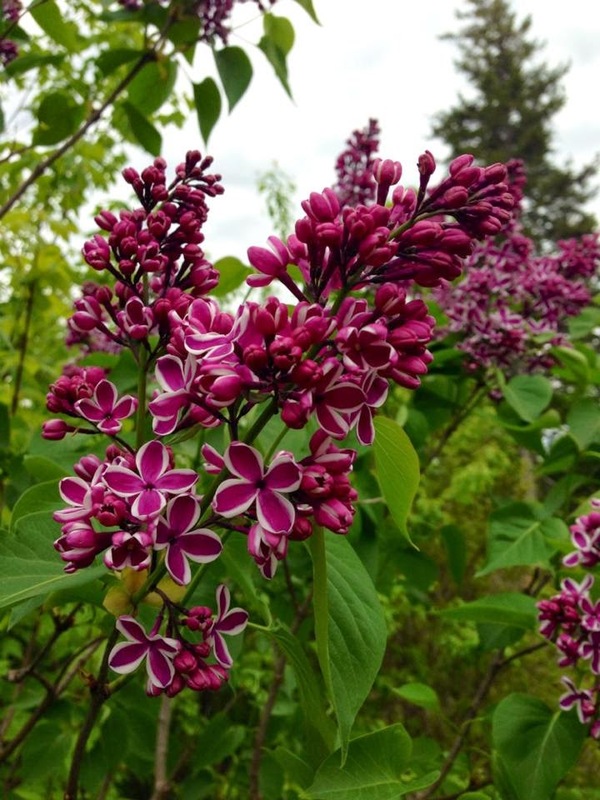 For the month of May I participated in the David Suzuki Foundation 30 x 30 Nature Challenge, along with Eco Novice and Eco Yogini. I value time in nature, not just because it is good for my health, but also because I enjoy the sensory experience of being outside. I enjoy observing the insects as they go about their business. I find it relaxing to listen to the wind rustling the leaves, and I have been known to fall asleep to the sounds in the Mama-Do-Nothing-Chair. And to me there is no better smell than the wet soil after a rain storm. Now that the challenge is over, I am looking for a variety of ways to continue to spend time in nature. Play is important for children, but I believe that everyone should play. Time in nature provides so many opportunities to play beyond they typical nature walks and hide and seek. Here are some ideas for nature play that will get everyone, young or old, interested. My daughters, like most kids, enjoy collecting little nature treasures of rocks, leaves and sticks when we go on walks, and I am continually finding acorns and leaves in my bags and rocks in the washing machine. Creating a mandala, a circular pattern, is a great way to use the special collections that kids keep. Once the mandala has been created, take a photo of it and make a mandala scrapbook. 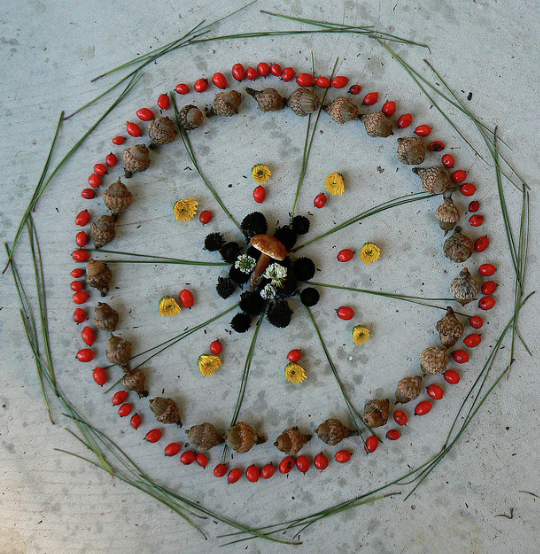 Playful Learning has a great tutorial for creating nature mandalas. 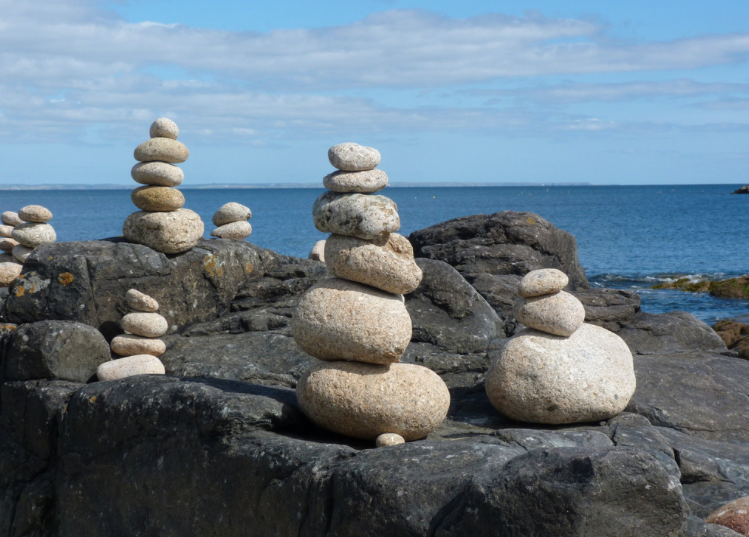 I am always amazed and intrigued by the seemingly precariously balanced rock sculptures I see on beaches and river banks, and I have always wanted to try making one. The possibilities are endless with this one, and it can be turned into a rock balancing competition too. For the younger folk, My Nearest and Dearest has fun ideas for making pictures with rocks. Light sensitive paper is a wonderful way to create imprints of natural materials. I have used these with my own class of ten and eleven year old students when we were learning about connecting with nature (this David Suzuki Foundation education guide). We went on a nature walk at a nearby nature park, talking about what we saw and collecting a few natural items we found on the ground. Then we lay our favourite items on the light sensitive paper and placed in a window. 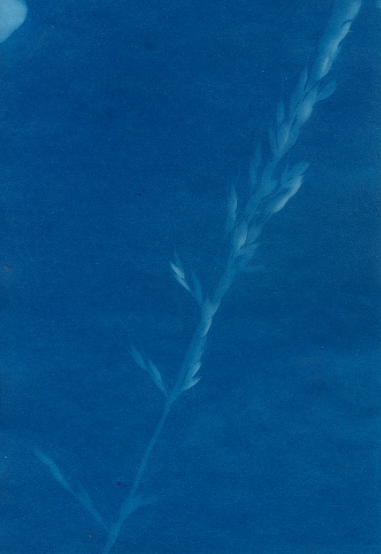 The paper that is exposed to the light turns white, but when it is rinsed in water it creates a negative impression, with the exposed paper turning a dark blue, revealing the white silhouette of the item left behind. We turned this into an inquiry project because the students wanted to know if it would work with different types of light. We created an experiment comparing our results with direct, indirect, fluorescent light and candle light. 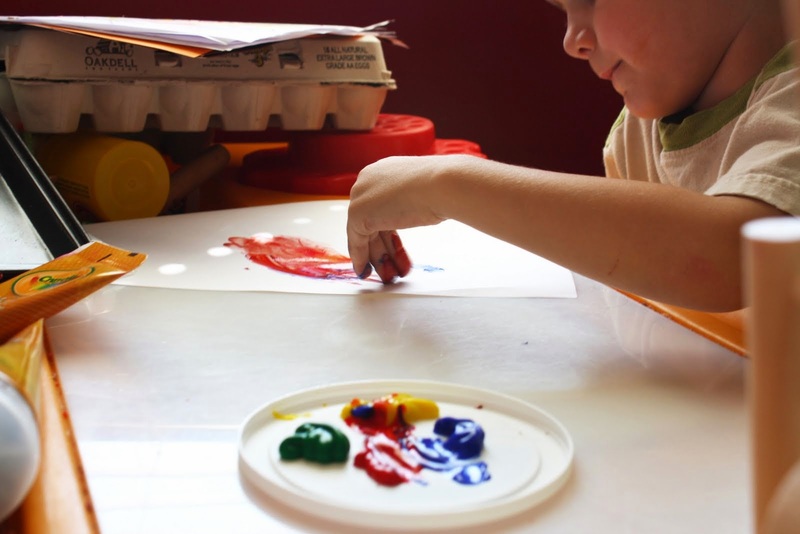 If you don't have access to light sensitive paper it is fun to create nature prints using a toothbrush or paintbrush to splatter paint onto paper covered with natural items. Remove the items after drying to reveal a print. 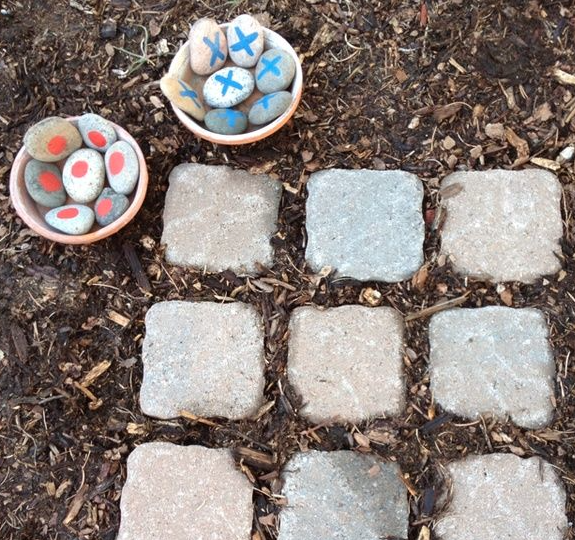 If creating isn't your thing, you can play games outdoors using found items, like this tic tac toe game. Instead of painting on the rocks, one person can be rocks and another can be leaves or shells, and the board can be lines drawn on the ground. For more active play, scavenger hunts are a great way to get small or large groups of people involved in playing outdoors. You can create your own scavenger hunt lists or find some already created. 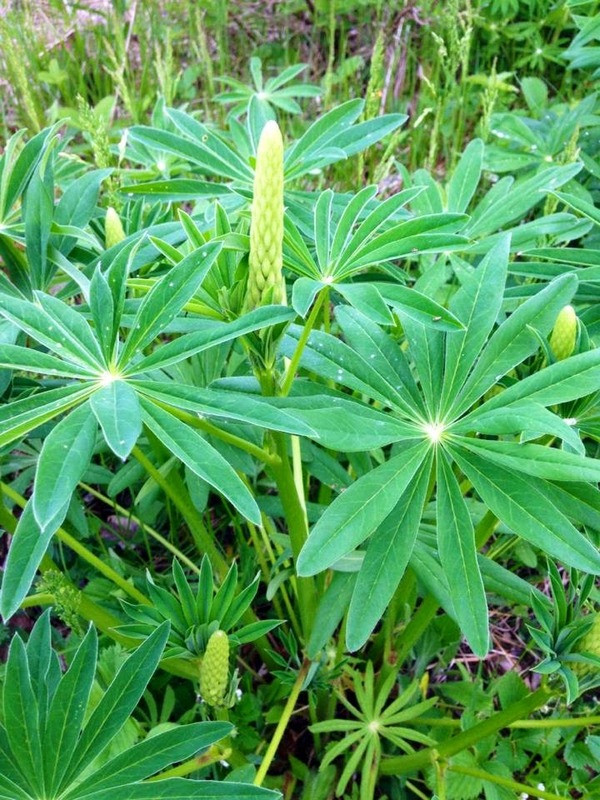 Debi at Go Explore Nature, who is a big outdoor play advocate, has great suggestions for creating your own scavenger hunt. She has also created hunts for each season, and I am looking forward to trying one out this summer. Creative Family Fun has created a listening walk hunt, which I love to help kids be more mindful of their surroundings. Using this idea, it would be fun to make a hunt for each of the senses! This is just a beginning to experiencing nature in different and unique ways. Do you have any ideas to add to the list? Eco-novice challenges you to consider, How much nature do you need? The David Suzuki Foundation's 30 x 30 Nature Challenge has just ended. 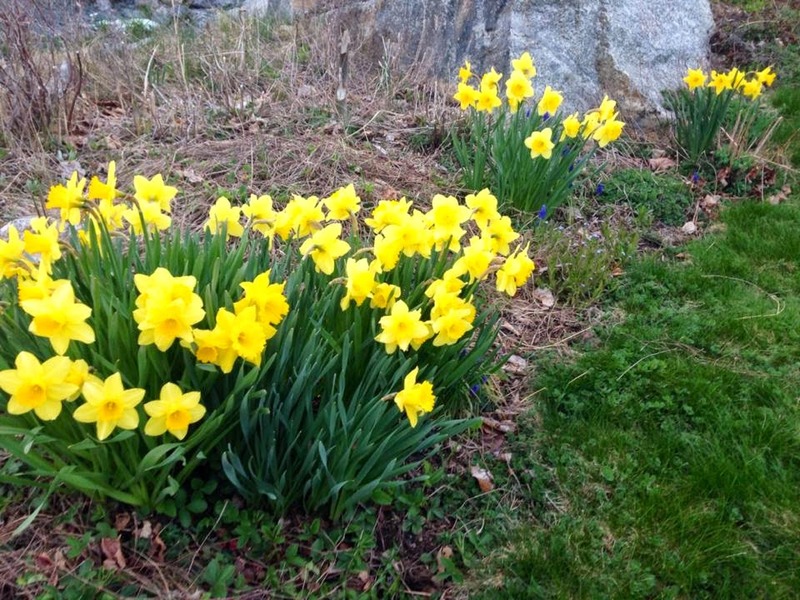 Those who accepted the Nature Challenge tried to spend 30 minutes outside in nature for 30 straight days (May 1 - 30). 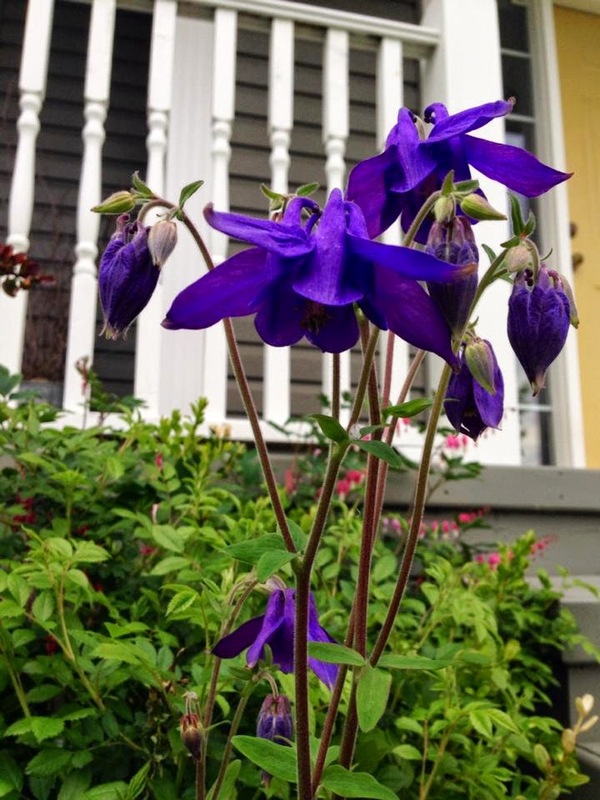 Three different Boothers participated in and posted about the Nature Challenge (Eco-novice, Ecoyogini, and Queen Composter), and I loved reading their reflections and getting to know their neighborhoods and "naturehoods" through their amazing photos. So I thought it would be fun to publish a round-up of our posts here on The Green Phone Booth. If you need some inspiration for getting outside, or just want to take a peek at some of the Boothers' environs, I heartily encourage you to click on over and check out some of the individual posts. Let the Nature Challenge Begin! Queen Composter lays out her tentative plan for making it a priority to get outside for 30 minutes over 30 days. Queen Composter finds it easy to get in her nature time as she begins biking and gardening more. 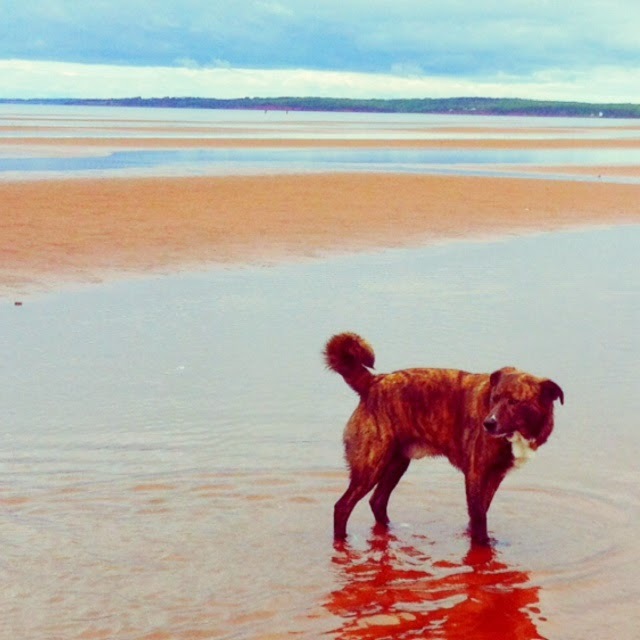 Photo reprise includes shots of nearby beach (lucky! 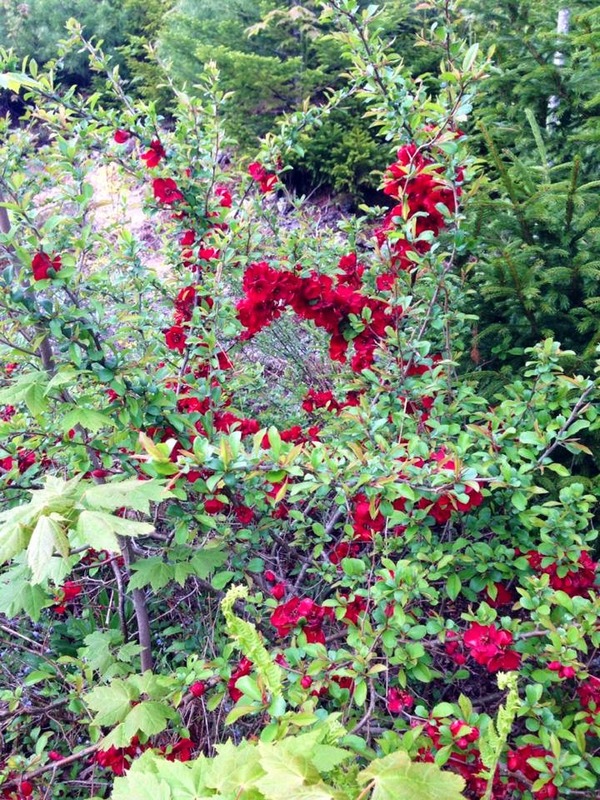 ), garden delights, her new mason bees, and her girls up in the tree. With less cooperative weather, Queen Composter finds it harder to get outside every day. In addition to more fabulous photos (you must see the dragonfly! ), she writes about the positives resulting from getting outside more. Despite the siren call of the sofa, Queen Composter continues to make outside time a priority thanks to her participation in the Nature Challenge. 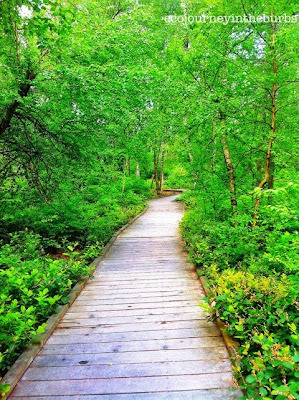 More gorgeous photos of her "naturehood" that I cannot believe she manages to capture with her iphone. This week Queen Composter and her daughters tried geocaching! More photos as well as highlights and downsides (= indoor tasks neglected) of the 30 x 30 Nature Challenge. Getting More Nature in Your Diet: 30x30 David Suzuki NATURE CHALLENGE! 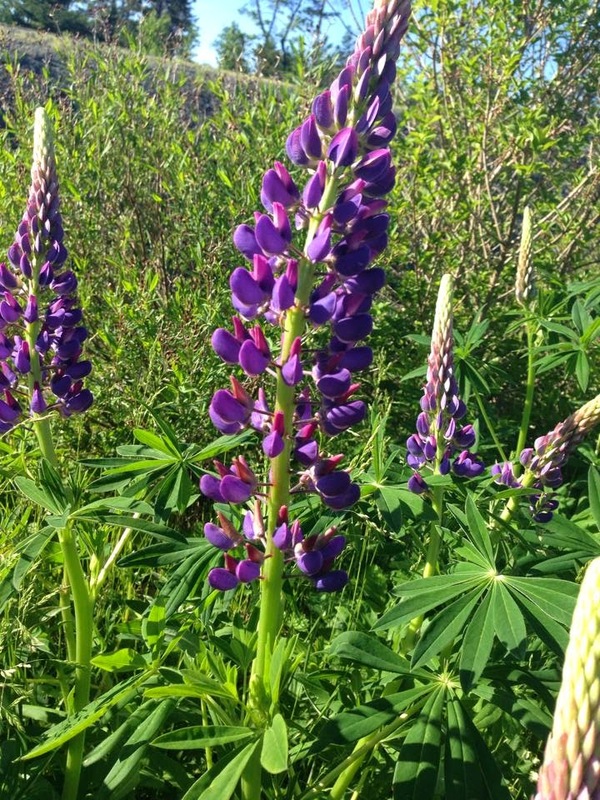 Ecoyogini shares some of the benefits of time in nature and gives a rundown of her first week of the challenge. She ends with an account of her and hubby stargazing. Spoiler alert: they saw the planet Mars! Is 30x30 Only for the True Belie-verts? Ecoyogini identifies some of the results of her "nature boost," including meaningful connections with loved ones. 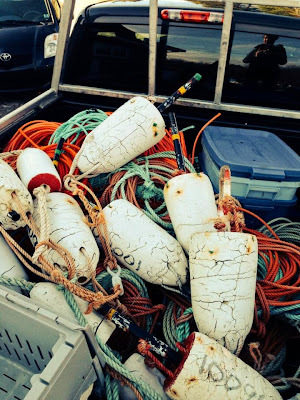 I love the photos in this post of Ecoyogini helping her dad with the lobster fishing. Ecoyogini reflects on how she did and "what the 30x30 challenge did for me," including getting her practicing yoga outside on the deck after work. 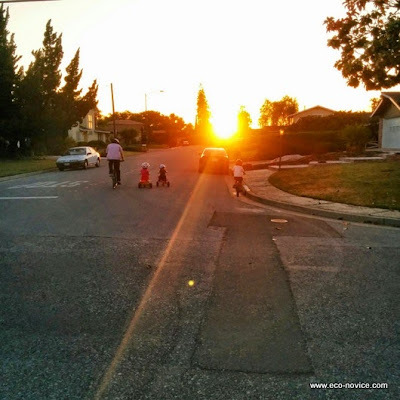 I describe my personal version of this challenge: 30 minutes outside every day with my kids. Then I share my ideas for ways to enjoy 30 minutes outside with kids. 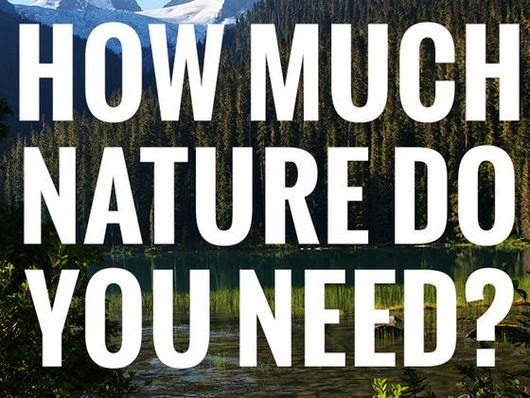 There are some seriously amazing (and well-documented) benefits of spending time in nature! I share 13 of those before giving a day-by-day run down (with photos) of our first week of the challenge. Some weeks my kids practically live outside. But certain days they need a little nudge to go outside to play. Here are 10 ways I successfully enticed my kids to go outside during our 30 x 30 Nature Challenge. I reflect on a lesson I learned during my teaching days: make time every day to do the things that you love. And because spending time outside with my kids is something I both enjoy and value, I decide that I'm going to continue making time to be outside in nature every day. This post includes photographic highlights of our last few weeks of the challenge. Is your family getting enough nature time? 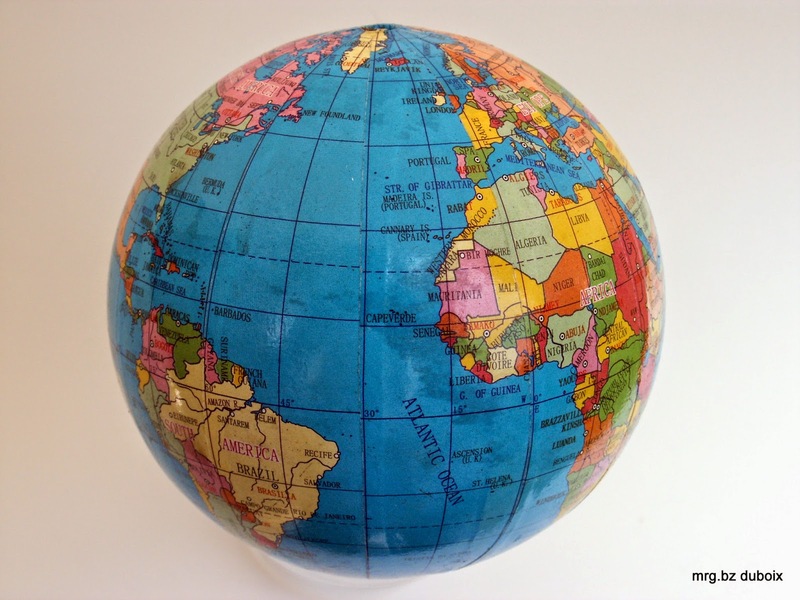 The Climate Crusader is reflecting on the intersection of geography and environmentalism. I am taking some classes at my local university at the moment, upgrading my credentials with the hope of becoming a teacher. My first degree was in engineering, and now I need to broaden my horizons with English and history and art classes. This summer I'm taking a geography class that's giving me an overview of Canada. As someone who's spent countless hours poring over old editions of National Geographic, it's probably no surprise that I'm enjoying this quite a lot. During the first lecture my professor pointed out the importance of place and the impact it has on the course of our lives. The fact that I was born in the greater Vancouver area in Canada instead of in Toronto or the Arctic or rural Oklahoma or Australia or Nigeria or China has implications for my health, my life expectancy, my worldview and the kind of career I pursue. Because of where I live I speak English, I had a particular kind of education and I am raising my children in a particular sort of way. One of the things that impacts the geography of a place is its physical environment. Living in the developed world it's really easy to overlook the physical geography of the place you live. Of course I know that I live near the mountains and the ocean, and I know that it rains a lot here. However, a good portion of my life is lived indoors. I work indoors, I cook indoors, I sleep indoors, I watch TV indoors. I'm even in a sort of moving shelter when I drive, which is more like being indoors than outdoors. All the same, the environment of the place that you live impacts your health and well-being in big ways. Depending on where you live, your exposure to air and water pollution changes. Your access to healthy food and organic food changes. The temperature changes, which can cause you to spend more time indoors if it's really hot or really cold. If you have kids, their exposure to environmental pollutants and toxins also changes. There are very real impacts to your well-being based on the environment of the place that you live. What's my point? My point is that we often think of taking steps to protect the environment in abstract terms. We recycle because we know it's a good thing to do. We forget that the steps we take, and the steps other people in our community take, can have a very real impact in our own lives. If charity starts at home, so too does environmentalism. Of course there are global impacts to our actions, but there are also local impacts, and those local impacts literally hit closer to home. Since I started the geography class I've been thinking about how I can make my own community a little bit better. It's important to me that my children have clean air and clean water, that they spend lots of time outside and that they have access to fresh, local food. I can help make those things happen by telling my local government what matters to me, by growing a garden and supporting my local farmers' market, by driving less myself, and so on. If we want to save the planet, maybe the best way to do it is one community at a time.